Recent world events, such as the threat of an al-Qaeda attack and the Wall Street meltdown, have left many wondering about the stability of the future. In his book, ‘Infinite Exposure,’ author Roland Hughes delivers a fictional story that exposes real life vulnerabilities. ‘Infinite Exposure’ tells a story about the events leading up to a major al-Qaeda attack that has a devastating global impact. Within the story, several international plots unfold and become entwined in a major al-Qaeda plot to steal money from one of the most powerful banks in the world. Kent Braxton, a CEO of First Global Bank in the US, is a young opportunist who is looking for a quick way to advance his career. He secures the services of Big Four Consultants to help migrate all of the bank’s data centers to one central location in India. The purpose is to save the Bank millions of dollars which he hopes will result in a promotion. Kent knows nothing about IT and the risks associated with offshoring such a powerful international bank with branches all over the world. The result of the migration will be one third of the world’s money supply will pass through the new data centre. The plot takes a turn when an al-Qaeda operative infiltrates the new data center and plots to steal all of the money. Meanwhile in America, a corporate shredder by the name of Lenny, implements a plan to illegally manipulate the bank’s stock in order to make billions when the bank falls. A software company becomes involved in the deal which further complicates matters. As well, members of the Reformed Nazi Party become involved with the processing of captured al-Qaeda members by harvesting their organs and stem cells. The entanglement of the various plots results in a horrifying global catastrophe. ‘Infinite Exposure’ is a well written story that exposes serious flaws in the business of moving jobs offshore. The major focus of the story reveals how the current policies and practices of Corporations and Governments can have devastating global ramifications. Themes of greed, arrogance, and selfishness, predominate throughout the story. Hughes lays out a plot that entails how easy it is to manipulate stocks to influence the success or failure of a business. Through a diverse range of intriguing characters, readers will see how arrogance and greed can lead to devastating consequences, particularly Kent’s emotional decline. Most notable is how CEOs lack IT understanding. Hughes is able to successfully tie the plots together to create a page-turning tale of suspense. His technical knowledge and expertise add to the credibility of this type of event actually occurring. 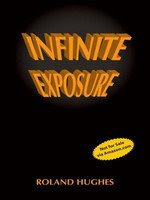 ‘Infinite Exposure’ is highly recommended to readers who enjoy high stakes suspense novels that reveal important messages about current world issues.